A big green bus delivers food and assistance to residents in D.C.'s "food desert" communities. WASHINGTON — JuJu Harris sits on a curb in Northeast D.C. near a truck- turned-farm-stand that’s loaded with September’s bounty — kale, tomatoes, squash, onions, peaches and the first apples of fall. Harris says she remembers the first day the Arcadia Mobile Market drove into the Parkside-Kenilworth neighborhood. “One of the residents came up and said to us, ‘This is so great you are here. All they want to sell us in this neighborhood is death,'” Harris says. The Arcadia Mobile Market brings something new to the neighborhood and to other food-insecure areas like it: fresh, local produce. 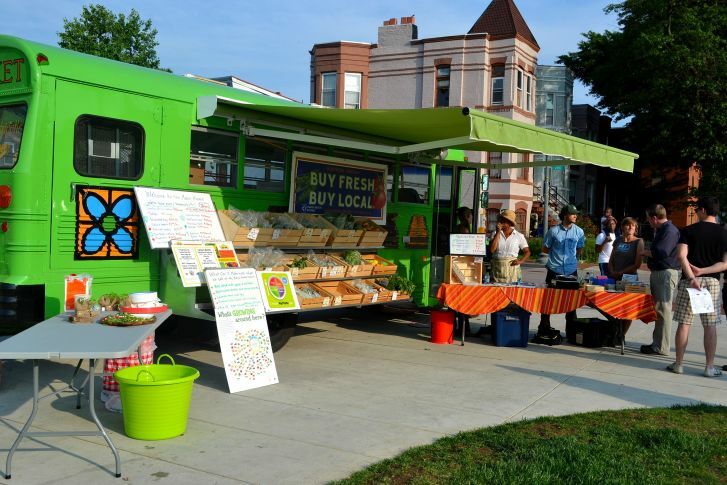 Arcadia, an Alexandria, Virginia-based nonprofit, has two mobile markets that serve 18 area neighborhoods that lack traditional markets. Sixteen are in D.C., one is in Maryland and one is in Virginia. Many of the residents in these neighborhoods struggle to feed their families with government food assistance in the form of food stamps or vouchers. Arcadia’s Mobile Market launched in 2012, and was started by Michael Babin, the owner of Neighborhood Restaurant Group, the umbrella company for several popular eateries in the D.C. area. In the past three summers, Arcadia has grown from one bus to a second vehicle, as well as two farms that are used to educate local school kids. The farms also provide some of the produce sold at the mobile markets. The rest comes from farms within 150 miles for the District — a testament to the program’s effort to support local, sustainable agriculture. “We are able to bring it right from the farm to our truck and then straight to the people,” says Harris, culinary educator and SNAP outreach coordinator at Arcadia. However, she emphasizes that access to fresh, healthy food is just part of the mission of the market. Through a system of matching grants, Arcadia also makes its food affordable by doubling the value of food assistance coupons and vouchers. Harris is no stranger to the struggles the market’s customers experience. When her sons were small and money was tight, she sought assistance through Women, Infants, and Children. WIC is a program that provides nutritional aid for women, infants and children. “I know what people are going through when it comes to trying to use the resources that you have to feed your family,” she says. Winter squash and beets are starting to appear at the market, and Harris says her cooking demos will soon shift to the distinctive flavors of autumn. She is a firm believer in seasonal cooking, and her favorite recipes were recently compiled into a cookbook that has been distributed free to customers who are on food assistance. In large mixing bowl, toss together the beets and greens, In a separate bowl, whisk together the olive oil, vinegar, Dijon mustard and minced garlic. Pour the dressing over the salad and toss to coat. Season to taste with salt and pepper. Allow the salad to stand at room temperature for 15 to 20 minutes before serving. Add some toasted pecans, goat cheese or orange slices to jazz it up a bit.